This didn't turn out so great but it's not likely the recipe's fault -- so taste-wise, I'm going to recommend it anyway. The corn wasn't so great, on the starchy side. My grilling work was, well, inexpert. I was out of mayo so quick-quick made some but homemade mayonnaise, while delicious, lacks the bite of commercial brand. 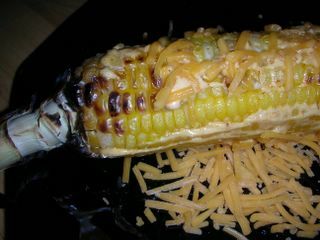 And finally, I think the cheese is supposed to melt on the hot corn and for some reason, tonight's didn't. I will try again some time. I bet it'll turn out to be delicious! This recipe is a perfect example of why, for everyone's health, all cooking magazines and all cookbooks MUST include nutrition information with recipes. Here's the dialogue that would have gone on in my head without access to real information. Sure it's got some mayonnaise. But it's light mayo! And only 1/3 cup for four people! And sure there's a bit of cheese, but only 1/4 pound for four people! How bad can it be? To analyze your own recipes, I'm happy to recommend software called AccuChef for nutrition analysis. In addition, we need to ask/encourage/insist that our favorite recipes sources include nutrition information. Active time: maybe 15 minutes? Spread the mayonnaise mixture on each cob, then roll in the cheese. Can I share with you how we enjoy corn in India? Grilled (this works well even on the stove)...you take a wedge of lemon, dip it in a mixture of salt and cayenne pepper (what we call red chilli powder), then rub it on the hot corn. mmm. and fat free. although it *is* a tad salty. Hi! I just discovered your blog thanks to a link on David Lebovitz' blog. I was given a big box of corn and am looking for fun ways to use it, so your corn recipe index has been great. The Mexican Street Corn recipe you're familiar with is a bit off though. Street vendors in the region I'm familiar with (Northern Baja California or "El Norte") cook their corn in water, and they give a few different serving options. The works (or "con todo") would generally be an ear of corn that is bathed in lemon juice and hot sauce, then coated with either mayonnaise or Mexican sour cream (which is kind of like creme fraiche) and coated with "queso cotija" (a pungent Mexican dry cheese named for the town it comes from). If you ever tried corn this way you could probably use Parmesan cheese if you can't get Cotija cheese. Just thought I'd pass that along. Thanks for all the great recipes!